Please note: Kampa have recently changed the design of these poles to include a wingnut adjustment in place of a clip as pictured. Designed to easily attach to your existing roof pole system the Monsoon roof poles offer more support for your awning roof in heavy rain, making it another excellent product from Kampa for giving you peace of mind in the worst of weather conditions. Helps prevent water pooling on the roof of your awning. Complete Kampa Rally Monsoon pole made exclusively for the Kampa Rally Ace awning. 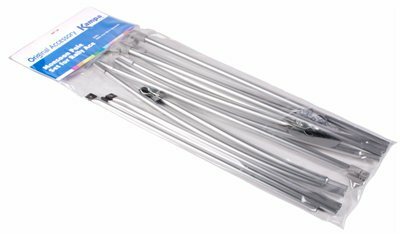 A set of three poles made from lightweight aluminium with flat pocket end section, adjustable quick lock adjuster and strong clamp fitting - providing additional roof support for your Kampa Rally Ace awning. I own a Kampa Rally Ace 400 awning bought new for 2014. I love the awning but it should be sold with the monsoon poles. We did have some wet days on our 3 week holidays and the awning is in danger of getting damaged due to the bellying on the roof which occurs in between the main support poles on the roof. 3 pools will quickly appear and will have to be continuously lifted to empty. We used bamboo stakes to keep the pooling away in the end. For an expensive awning to have to buy 75 euro worth of monsoon poles is not good enough. That and no storm straps an extra 20 euro for those. These items should be part of the awning when you buy it because they are necessary at all times once the awning is put up. Bought the Rally Ace 400 a few years back. But great service from Camping World for matching the Amazon Price. Camping World have great postage prices for Germany !!! Will order again !! If you have this type of awning this is essential. Should be standard with the awning. These are specifically for the ace 400 to stop water pooling on the roof.